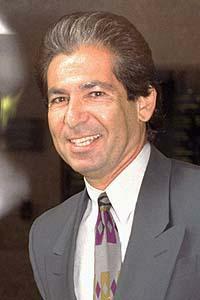 Robert George Kardashian (February 22, 1944 – September 30, 2003) was an American attorney and businessman. He gained national recognition as O. J. Simpson's friend and defense attorney during Simpson's 1995 murder trial. He had four children with his first wife, Kris Kardashian (née Houghton, later Jenner): Kourtney, Kim, Khloé, and Rob, who appear on their family reality television series, Keeping Up with the Kardashians, and its spinoffs. Kardashian was born in Los Angeles, California. He has a sister and brother, Barbara and Tom Kardashian. His great-grandparents, Saghatel ("Sam") and Harom Kardaschoff, were ethnic Armenian Spiritual Christian Prygun immigrants from Karakale (now: Merkezkarakale), Kars Oblast of the Russian Empire (now Kars Province in Turkey). The family, known at the time by the surname Kardaschoff, in Russian style, made their way from their home village of Karakale probably to Bremerhaven, Germany, a popular emigration port. From there, they travelled to a new life in America. Their son Tatos anglicized his name to Tom, started a business in garbage collection in Los Angeles, and married another Kars-Karakale immigrant, Hamas Shakarian. This article is about the attorney. For his son, the television personality, see Rob Kardashian. Robert George Kardashian (February 22, 1944 – September 30, 2003) was an American attorney and businessman. He gained national recognition as O. J. Simpson's friend and defense attorney during Simpson's 1995 murder trial. He had four children with his first wife, Kris Kardashian (née Houghton, later Jenner): Kourtney, Kim, Khloé, and Rob, who appear on their family reality television series, Keeping Up with the Kardashians, and its spinoffs. Kardashian was born in Los Angeles, California. He has a sister and brother, Barbara and Tom Kardashian. His great-grandparents, Saghatel ("Sam") and Harom Kardaschoff, were ethnic Armenian Spiritual Christian Prygun immigrants from Karakale (now: Merkezkarakale), Kars Oblast of the Russian Empire (now Kars Province in Turkey). The family, known at the time by the surname Kardaschoff, in Russian style, made their way from their home village of Karakale probably to Bremerhaven, Germany, a popular emigration port. From there, they travelled to a new life in America. Their son Tatos anglicized his name to Tom, started a business in garbage collection in Los Angeles, and married another Kars-Karakale immigrant, Hamas Shakarian. Growing up in the Baldwin Hills area of Los Angeles, Kardashian attended Susan Miller Dorsey High School and the University of Southern California, from which he graduated in 1966 with a B.S. degree in business administration. He earned a J.D. degree from the University of San Diego School of Law and practiced for about a decade; after that, he went into business. In 1973, Kardashian was one of the co-founders of the trade publication Radio & Records, which he and his partners sold for a large profit in 1979. Kardashian also pioneered the idea of playing music between movies in theaters. He subsequently parlayed the concept into a business, starting a company called Movie Tunes. He served as President and CEO of the firm and later invested in Juice Inc., a frozen yogurt company, and in a music video business called Concert Cinema. Robert Kardashian dated Priscilla Presley from 1975 to 1976. He had four children with his first wife, Kris Kardashian (née Houghton, subsequently Jenner): Kourtney, Kimberly, Khloé, and Rob. The couple separated and divorced in 1991. Shortly after separating from his first wife in 1991, Kardashian became engaged to Denice Shakarian Halicki, widow of movie producer H.B. Halicki. The couple never married. In 1998, Kardashian married Jan Ashley; however, the marriage ended in annulment 30 days later. Ashley later claimed frequent upset and turmoil related to Kardashian's ex-wife Kris and their children "were instrumental" in the demise of the relationship. After dating for three years and proposing in 2001, Kardashian married his third wife, Ellen Pierson (née Markowitz), six weeks prior to his death. Kardashian and Simpson first met in the early 1970s and became close friends. Following the June 12, 1994, murder of Nicole Brown Simpson and Ronald Goldman, Simpson stayed in Kardashian's house to avoid the media. Kardashian was the man seen carrying Simpson's garment bag the day that Simpson flew back from Chicago. Prosecutors speculated that the bag may have contained Simpson's bloody clothes or the murder weapon. When Simpson failed to turn himself in at 11 a.m. on June 17, 1994, Kardashian read a letter by Simpson to the assembled media. This letter was interpreted by many as a suicide note. Simpson was charged with the murders and subsequently acquitted of all criminal charges in a controversial criminal trial. Kardashian had let his license to practice law become inactive before the Simpson case but reactivated it to aid in Simpson's defense as a volunteer assistant on his legal team, alongside Simpson's main defense attorneys, Robert Shapiro and Johnnie Cochran. As one of Simpson's lawyers and a member of the defense "Dream Team", Kardashian could not be compelled or subpoenaed to testify against Simpson in the case, which included Simpson's past history and behavior with his ex-wife Nicole, and as to the contents of Simpson's garment bag. He sat by Simpson throughout the trial. Kardashian visited Simpson in jail regularly. According to an interview with the Los Angeles Times, Kardashian said, "I've never been in a jail before. It's extremely depressing. It makes me sick every time I go down there. We can't have any physical contact. I want to hug him, I want to show him that I care. It's very difficult." The New York Times reported that Kardashian said in a 1996 ABC interview that he had questioned Simpson's innocence: "I have doubts. The blood evidence is the biggest thorn in my side; that causes me the greatest problems. So I struggle with the blood evidence." Kardashian was diagnosed with esophageal cancer in July 2003. He died two months later, on September 30, 2003, at age 59, and was buried at Inglewood Park Cemetery in Inglewood, California. Kardashian was portrayed by David Schwimmer in the 2016 FX miniseries American Crime Story: The People v. O. J. Simpson. Schwimmer was nominated for the Primetime Emmy Award for Outstanding Supporting Actor in a Limited Series or Movie for his performance, but lost to Sterling K. Brown, who portrayed Christopher Darden in the same series. In 2016 ESPN Films and their 30 for 30 series produced a five-part miniseries called O.J. : Made in America produced by Ezra Edelman. In 2017, Kardashian was the subject of the pilot episode of the TV comedy series Over My Dead Body on Amazon Prime. ↑ "Robert Kardashian net worth". Richest celebrities. Retrieved March 16, 2016. ↑ "Obituaries". The Desert Sun. May 28, 2008. ↑ "Helen Kardashian - Kim Kardashian: Official website". Kimkardashian.com. Retrieved 2015-05-14. ↑ Conovaloff, Andrei. "Taxonomy of 3 Spiritual Christian groups: Molokane, Pryguny and Dukh-i-zhizniki — books, fellowship, holidays, prophets and songs". Spiritual Christian Around the World. Retrieved December 27, 2016. ↑ Harvey, Oliver (March 16, 2012). "Kim Kardashian is keeping up with the Armenians". The Sun. London. Retrieved September 3, 2012. 1 2 Beth Shuster, "Kardashian-Simpson Bond Stands Test of Time, Trouble", Los Angeles Times, July 6, 1994. ↑ "Who Was Robert Kardashian, Sr.?". Wetpaint. Retrieved 22 February 2016. ↑ "The People v OJ Simpson: Who was Robert Kardashian? (Aside from Kim's dad)". The Telegraph. Retrieved 22 February 2016. ↑ "Robert Kardashian, a Lawyer For O. J. Simpson, Dies at 59". The New York Times. Retrieved 22 February 2016. ↑ "50 Things You Probably Didn't Know about Kim Kardashian". Boomsbeat. Retrieved 22 February 2016. ↑ "The Kardashians' bizarre involvements with O.J. 's trial". Looper. Retrieved 22 February 2016. ↑ Eric Malnic (October 2, 2003). "Robert Kardashian -- friend and lawyer of O.J. Simpson". Los Angeles Times. Retrieved 22 February 2016. ↑ "Photo of Robert Kardashian with his children". What's Good? Online. ↑ Dominick Dunne, "Three Faces of Evil" Vanity Fair, June 1996. ↑ Mike Fleeman, "Stand By Your Man", Los Angeles, October 1996. ↑ "Stand By Your Man". Los Angeles Magazine. Oct 1996. Retrieved April 10, 2016. ↑ Mohan, Keerthi (October 9, 2014). "Bruce Jenner Might have Called it Quits with Kris Jenner Because of her Children: Report". International Business Times. Retrieved April 19, 2015. ↑ "Declaration of Robert Kardashian" (PDF). TMZ. Retrieved April 19, 2015. ↑ Amber Garrett (June 10, 2013). "Who is Robert Kardashian's Widow, Ellen Pierson Kardashian?". Wetpaint. Retrieved April 10, 2016. 1 2 3 Reed, Christopher (October 6, 2003). "Obituary: Robert Kardashian". The Guardian. London. Retrieved November 22, 2010. ↑ "O.J. Simpson trial: Testimony about Simpson's trip to Chicago". CNN. October 11, 2007. Archived from the original on March 5, 2012. Retrieved October 17, 2011. ↑ Lowry, Brian (June 21, 2010). "From the couch: O.J. 's legacy continues". Fox Sports. Archived from the original on July 15, 2010. Retrieved November 22, 2010. 1 2 "Robert Kardashian, a Lawyer For O. J. Simpson, Dies at 59". The New York Times. October 3, 2003. Retrieved November 22, 2010. ↑ "O.J. Simpson lawyer, Kardashian, dies". CNN. October 1, 2003. Retrieved November 22, 2010. ↑ Gnerre, Sam (July 26, 2014). "The Inglewood Park Cemetery predates the city's incorporation". Daily Breeze. Retrieved 2016-04-18.